The Norwegian band Mundanus Imperium started under the name Nattefall and released a 3-track demo titled Ode To The Nightsky. Later they changed their name to Mundanus Imperium and the demo was re-released on cd in 1997. This early material is mostly atmospheric black/dark metal. 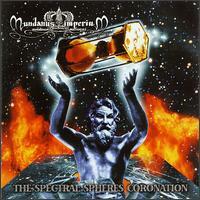 In 1998 the band released a full-length album called The Spectral Spheres Coronation with an improved line-up; the biggest change being the vocals that were handled by the hard rock voice Jørn Lande. Besides the vocals, the album is much more symphonic and powerful than the demo tracks. Since that, Mundanus Imperium has been disbanded or at least inactive. Jørn Lande has been singing in various bands (Masterplan, Beyond Twilight, Jørn a.k.a. Jorn, Vagabond, Yngwie Malmsteen, Ark etc.) He has also worked with Symphony X vocalist Russell Allen on the Allen/Lande-project. The other Mundanus' members seem to have disappeared from the music scene completly.